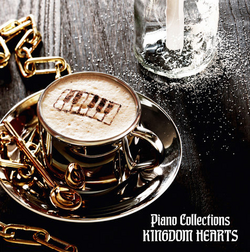 The cover of the Piano Collections Kingdom Hearts album. Piano Collections Kingdom Hearts is a compilation album of compositions from the Kingdom Hearts series arranged for solo piano by Kaoru Wada. It was released on May 27, 2009 in Japan. It was featured in an ad in the North American edition of Kingdom Hearts 358/2 Days manual booklet that is now available on the Square Enix website. Tracks 5 through 8 form a "Sonata on Themes of Kingdom Hearts".